I wanted to share this quick idea with you. 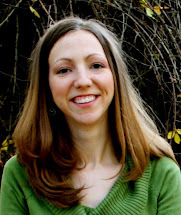 Our Relief Society presidency wanted to give all the ladies a small Christmas gift. 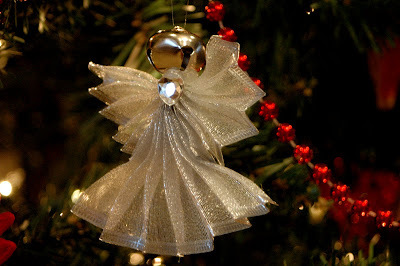 We wanted to give them an angel ornament but we had almost no budget for it so I scoured the Internet for ideas and found this one. Since we already had the ribbon and glue sticks it cost us $20 to make 75+ of them. 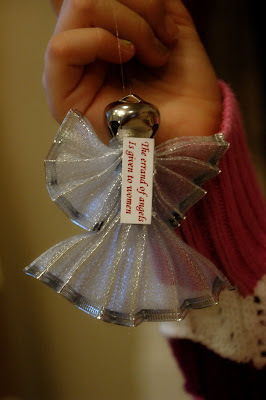 On the back we added the quote "The errand of angels is given to women"
You can't see the paper from the front. THIS, my friend, and many others are why you are always in the RS Presidency.....! How long is the piece of ribbon for each part? The instructions are pretty good, but it doesn't include that, which helps you know how much ribbon you need. They are Beautiful BTW. You can just fold it to your liking but when we made them we measured the skirt at appro. 8in and the wings appro 5in. Make sure you fold them so that the raw edges face the back... it will look cleaner/ nicer that way. Good luck! Merry Christmas!! I can't wait to try making these angels using a spring design wired ribbon, maybe for giving out when we go Visiting Teaching?! The attached piece of paper on the back "the errand of angels is given to women" won me over more than the angel herself. Every woman needs one of these little gals hanging in the kitchen, over the washer and dryer, near the rocking chair....everywhere we "toil" and sometimes forget who we are as mothers, wives and daughters of God! Thank you for an idea that brings peace to my heart all year round, not just at Christmas time. Hi! I'm looking for ideas for 2011 and just found this - but the link is no longer valid :(. It looks fairly simple, and I appreciate you giving the lengths in an earlier answer, but if you could tell me the ribbon width (looks really wide)and briefly how to assemble, I'd be very appreciative! I clicked on the link to get directions and it said the url doesn't exist anymore. If you could give a list of what I need and instructions on how to make them that would be great. It is such a cute idea. How do I find the directions for this angel? Really nice but can you post the directions and materials needed would love to make some. This tutorial was posted in another comment. It is longer than it needs to be and is slow, but it shows you how to do it. I will also include written instructions below. Cut 14 inch piece of 2 -3 inch wire edged ribbon. She showed the 2 inch ribbon, so the wider ribbon may need a longer piece with wider pleats, you may want to cut a longer piece the first time if you are using the wider ribbon. Fold into 7 one inch pleats forward and back like a fan. Cut off any excess left after the last pleat. Hold the pleats tightly together. Cut 10 inch piece of same ribbon. Fold into 5 one inch pleats. Hold tightly together. Staple in the center. Spread fanfolds for wings. Hot glue wings on top of dress bottom, press together. glue a 16 mm(or larger) bell on top of wings for the head. 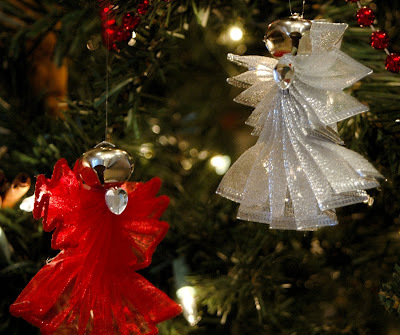 Place a ribbon, star or jewel to cover where the two parts joined at her waste. Thread a ribbon, thread or fishing line through the opening at the top of the bell. I made these for our Relief Society two Christmases ago and they turned out well and were appreciated by the sisters. We had a Christmas lesson on angels... So it was perfect!! !